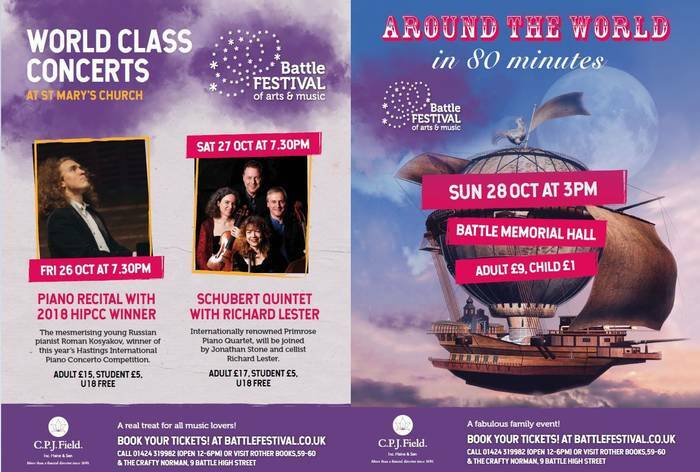 For the second year running we are proud to be sponsoring the Battle Festival of arts & music; a cultural gem featuring award winning artists and performances which cater for music lovers of all tastes and ages. This year we are delighted to sponsor the highly acclaimed ‘Weekend of World Class Concerts’ from Friday 26th to Sunday 28th October. The programme features performances from Roman Kosyakov, this year’s winner of the highly prestigious Hastings International Piano Concerto Competition; the internationally renowned Schubert Quintet who will be joined by cellist, Richard Lester; and a must see fun, family performance called ‘Around the World in 80 minutes!’ – Where you and all your family will have the opportunity to explore the world of classical music from around the world in this colourful performance. Any questions about end of life care and planning? We will also have an exhibition stand, where we invite you to come and speak to friendly members of our experienced team who will be on hand to answer any questions about end of life care and planning. Do pop by if you can, we’re a friendly bunch!